During the Fall 2008 semester, the Terra Preta @ MTU Working Group is functioning as the Technical Communication Division of the Department of Humanities' Professional Communication Arts Enterprise. Our Science Research Team Leader, Amanda Taylor, is quoted in the February 2009 issue of Environmental Health Perspectives, a journal dedicated to research on the impact of the environment on human health. There just happened to be a film crew in town. We are a group of MTU students currently exploring the feasibility of establishing the Terra Preta @ MTU Project as an Enterprise team or affiliating it with existing campus projects and initiatives. The impetus and commitment remain that the project is a reciprocal project with the local community, with shared access to resources, planning, and participation. We currently think of terra preta, or terra preta de indio as a framework for exploring the historical, archeological, anthropological, scientific, and indigenous aspects of “dark earth.” We think of biochar as a process and product that may be used as a soil amendment; that it may help increase soil fertility dramatically; and that it may help mitigate climate change via its carbon-negative sequestration qualities. 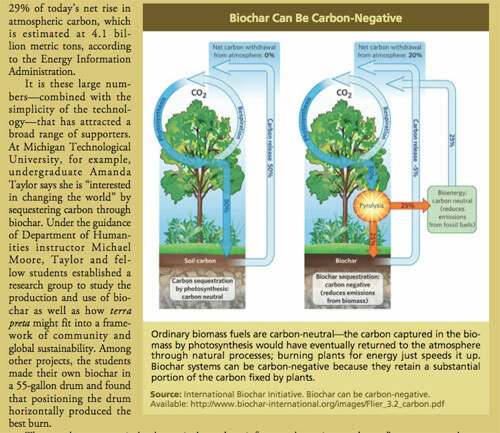 If you are interested in joining this university and community effort — as a community member, as a student, staff, or faculty member — write to Lydia and we will add you to our biochar-l mailing list and update you on future plans. That research is reported in Amazonian Dark Earths: Explorations in Space and Time (2004; p. 191) and more recently, in Slash and Char as Alternative to Slash and Burn (2007 ; p. 61). If you’re on or near the Michigan Tech campus, a copy of Slash and Char is available for review in 112 Walker Arts & Humanities. How should we contextualize that research for local and regional community members, farmers, and gardeners? How should we contextualize it as a way to learn about soil characteristics in the Upper Peninsula, regionally, and globally? How should we contextualize it for Michigan Tech faculty and graduate students in soil science, chemistry, environmental engineering, forestry, and humanities as a way to develop collective expertise? How should we contextualize it for possible fundraising and grant opportunities? What role can the working group play in local and regional efforts to understand terra preta (broadly) and biochar (specifically)? Where does terra preta fit in environmental, social, cultural, and manufacturing notions of “sustainability”? And on particularly reflective and socially aware days: what is the relationship between hip-hop culture, sustainability, and the environment?